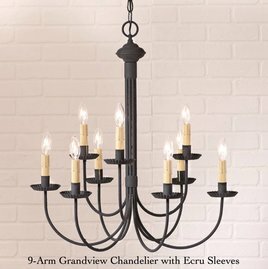 Bring a traditional & formal touch with the 9-Arm Grandview Chandelier in textured Black to your home. This beautiful chandelier is a wonderful choice to illuminate your dining area or in a foyer. Available with Gray or Ecru sleeves. Made in the USA.